In a particularly dramatic example, a thrust fault pushed crustal materials (arrows) up the side of the farside impact crater named Gregory (2.1 degrees N, 128.1 degrees E). By mapping the distribution and determining the size of all lobate scarps, the tectonic and thermal history of the Moon can be reconstructed over the past billion years. Themoon is shrinking ever so slightly, but there is no cause for alarm, accordingto a new study that has discovered a clutch of previously unseen faults on thelunar surface from photos taken by a NASA probe. Thesefault structures ? called lobate scarps ? are among the youngest landforms on the moon. Their distribution across the lunar surface (asopposed to regional distribution), suggests that cooling in the moon's interioris the likely cause of the contraction, or shrinkage, said study leader ThomasWatters, a scientist with the Center for Earth and Planetary Studies at theSmithsonian National Air and Space Museum. "Thesurface is pushed together by internal forces," Watters told SPACE.com. "When it breaks, it literally thrusts material upward because the surfaceis contracting. That contraction, we think, is coming from internal cooling ofthe moon. We now know that's a global process, so it means the moon isshrinking globally ? very likely because it is continuing to cool." Theresearch is detailed in the Aug. 20 issue of the journal Science. Lobatescarps were first recognized in photographs taken of the moon's equatorialregion by panoramic cameras flown on the Apollo 15, 16 and 17 missions in theearly 1970s. "Sincethe Apollo missionswere designed to land men on the moon, coverage from the Apollo photography wasvery limited, and only in the portion of the equatorial zone," Watterssaid. Photosfrom the Lunar Reconnaissance Orbiter Camera have now revealed how widelydistributed these landforms actually are on the lunar surface. "Wefound that these landforms occur not only elsewhere in the equatorial zone, butalso at high latitudes," Watters explained. "At least half of the 14that we report on were at latitudes higher than 60 degrees. Several of them arenear the lunar poles." Heexpects that as the LRO mission continues researchers will discover even moreof these structures. "Theultra-high resolution images from the Narrow Angle Cameras are changing ourview of the moon," said study co-author Mark Robinson, who is theprincipal investigator of the Lunar Reconnaissance Orbiter Camera at ArizonaState University. "We've not only detected many previously unknown lunarscarps, we're seeing much greater detail on the scarps identified in the Apollophotographs." Accordingto the study, there has been about 328 feet (100 meters) of change in themoon's radius over the course of about 1 billion years, said Watters. "Thisis a very small amount," he said. "I don't want to give theimpression that the moon is dramatically shrinking away." Watterswas able to approximate the age of the fault scarps by comparing them to othergeological landforms, and using a method of dating that examines the presenceof impact craterson the structures themselves. Hefound that the lobate scarps were small and narrow ? the largest ones being nomore than 6.2 miles (10 km) in length. Their pristine appearance was also agood indication of their young age. "Wedon't see any impact craters superimposed on them," Watters said. "They have not been partially obliterated by impact craters that have hitthem, so this tells us that they are very young. Features of this size wouldnot be expected to survive very long un-degraded on the lunar surface, simplybecause they would typically be obliterated by impact." Sincethe scarps were undestroyed and in good condition, Watters was able to assignan upper limit for the age of the landforms. "Theycan't be any older than a billion years, which is pretty recent in lunarhistory," Watters said. "They are so un-degraded and pristine lookingthat they could be very much younger than that. One of the intriguing prospectsis that these faults could be very recent, so we can't exclude the possibilitythat the moon is tectonically active today." Ifthe moon's interior is still cooling, it would provide evidence that the moonis still geologically alive and active ? which has been an area of study sinceseismographs first detected moon quakes during the Apollo era. 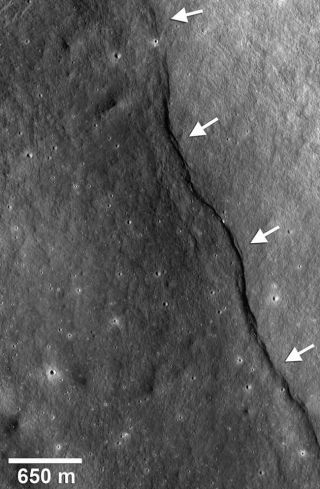 "Weknew things were going on inside the moon, but now one of the questions iswhether the lunar seismic activity that was recorded is possibly connected withsome of these young thrust faults," Watters said. Wattersis now hoping to use LRO's capabilities to create a global, high-resolutionimage map of the moon, which could help researchers find more of these lobatescarps. But, since the Narrow Angle Cameras on board LRO only capture verysmall portions of the lunar surface per image, building the map will take time. Inthe meantime, Watters is quick to stress that even if the moon is continuing toshrink, there is no reason to be alarmed. "Overa billion years, a 100-meter change in the radius is not very much,"Watters said. "The moon is not shrinking so much that you would everdetect it, and it's not going to shrink away. There are other planets, likeMercury, that have a lot more contraction." Lobatescarps have previously been found on Mercury, and the largest one is over 620 miles (1,000 km) inlength. "Mercuryis an example of a much greater radial-contracting body," Watters said. "This is due to the same process of interior cooling as on the moon, butit's happening on the moon in a much smaller way."